Peel and coarsely chop enough onion to measure ¾ cup [1½ cups]. Finely chop enough of the remaining onion to measure ¼ cup [½ cup]; set aside for garnish. If using the jalapeño, remove the stem, ribs, and seeds; coarsely chop the jalapeño. Wash your hands after handling. Prep and cook instructions are identical for both chicken options. Pat the chicken dry with a paper towel; cut the chicken into 1-inch pieces. Season generously with salt and pepper. In a large frying pan over medium-high heat, warm 1 to 2 tablespoons oil until hot but not smoking. Working in batches if needed, add the chicken and cook, stirring occasionally, until browned but not yet cooked through, 2 to 3 minutes. Transfer to a plate. Add more oil between batches if needed. Do not clean the pan. In the same pan used for the chicken, if dry, add 2 to 3 teaspoons oil. Warm over medium-high heat until hot but not smoking. Add the coarsely chopped onion and as much jalapeño as you like, season with salt and pepper, and cook, stirring occasionally, until starting to soften, 2 to 3 minutes. Add the tomatillo simmer sauce base, hominy, oregano, chicken and any accumulated juices, and 1 cup [2 cups] water. Bring to a boil, reduce to a simmer, and cook, stirring occasionally, until the chicken is cooked through and the sauce has thickened slightly, 8 to 10 minutes. Remove from the heat and season to taste with salt and pepper. When the pozole is almost done, prepare the garnishes. Strip the cilantro leaves from the stems. Transfer the pozole to individual bowls and garnish with the cilantro, pumpkin seeds, and finely chopped onion. Serve with the lime wedges. Measure the water for the pozole. “This was incredible, healthy, and filling—loved the hominy!” —Sun Basket customer Mary Frances H.
Holy pozole! 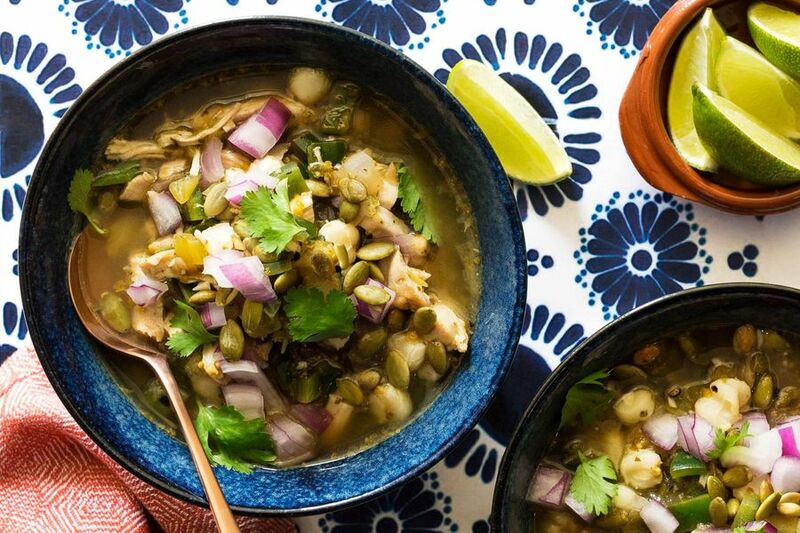 This clean eater's version of a Mexican classic is as healthy as it is delicious, relying on our custom tomatillo simmer sauce and an (optional) spicy jalapeño for big flavor. Skip the pumpkin seeds and you’ll drop 50 calories and 4.5 grams of fat from each serving. Stretch the dish into 3  servings and you’ll shed an additional 140 calories and 6 grams of fat from each portion. Hominy is a popular ingredient in Mexico and the American South. The dried whole corn kernels are first soaked in an alkaline solution and then washed in a process called nixtamalization, which improves the nutritional value of the kernels. You might also know them from ground hominy (aka masa or maíz molido) or hominy grits ((maíz machacado). The pozole (Steps 1 through 3) can be prepared up to 1 day ahead. Let cool, then cover and refrigerate overnight. When ready to serve, gently rewarm the pozole, adding 1 to 2 tablespoons water to thin the broth if needed, and prepare the garnishes (Step 4). Calories: 480, Protein: 36g (72% DV), Fiber: 9g (36% DV), Total Fat: 25g (38% DV), Monounsaturated Fat: 11g, Polyunsaturated Fat: 6g, Saturated Fat: 4g (20% DV), Cholesterol: 135mg (45% DV), Sodium: 650mg (27% DV), Carbohydrates: 34g (11% DV), Total Sugars: 8g, Added Sugars: 0g (0% DV).